Want to holiday like the rich and the famous in the Hampton or in the pretty European places like Greece and Italy? We found a seriously stunning villa very close to Kolkata that’s perfect for a vacation and is no less than going to Italy (or Greece) and back. Casa Nano is this gorgeous whitewashed villa at Raichak, by the banks of the Ganges River, absolutely perfect getaway for family and friends. Chill out surrounded by lush green landscape and a welcoming breeze from the Ganges. Swim, cook, bicycle along the river, take a long afternoon siesta or get in some pool time; reset yourself. Pause, rewind, play. It has three beautiful bedrooms, well-furnished living spaces, a woodfired oven and a pool for the young at heart. It’s been styled like a beachfront home in Mallorca or a charming villa on a Tuscan vineyard. Take our word and enjoy that laid back Mediterranean vibe brought on by the pretty and relaxed decor. The AC villa can accommodate six people in the three bedrooms with attached washrooms, a living and dining space and a fully equipped kitchen. You can relax on the expansive lawns or in the splash pool. They also have a bar counter, garden chairs and loungers. A caretaker and a housekeeping maid are available to help you around. You will have access to books, board games, DVDs, a music system, cable TV to help you relax and enjoy your holiday. 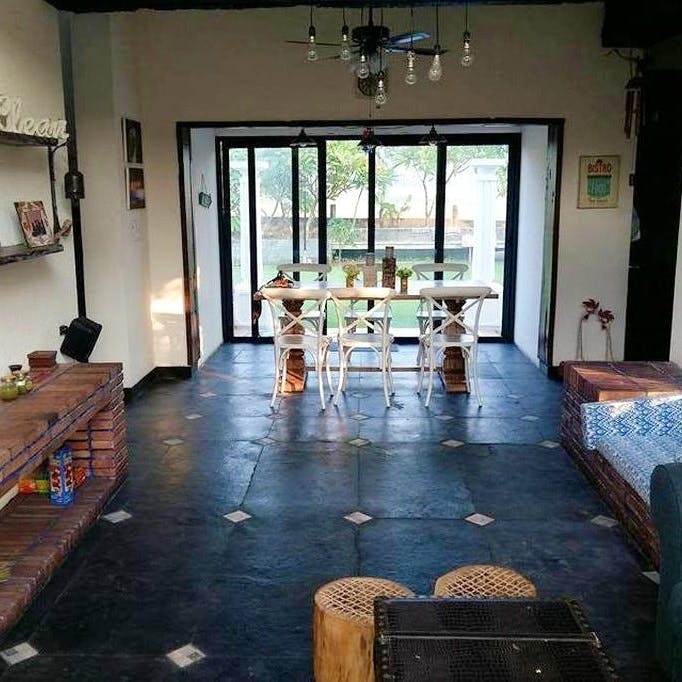 We came across this on Airbnb where a night’s stay for 6 people was INR 12,535. You can book a stay here. It’s just 47-odd kilometres from Kolkata. The best way to get there would be to drive down, or take a bus to Raichak and then take an auto to get to the location.